No, summer’s not winding down, and I have proof! This past Tuesday, September 2nd, was the hottest day of the entire season. This means summer plans on sticking around for a while longer. 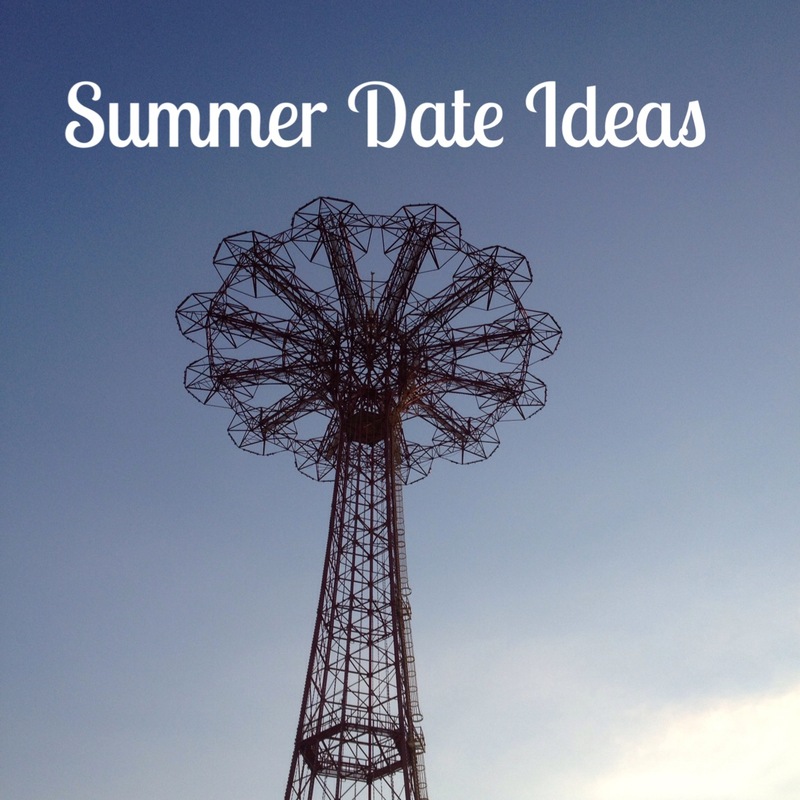 Venturing out to Brooklyn’s iconic Brighton Beach and Coney Island neighborhoods is one of my favorite ways to capture the spirit of a summer in NYC. The two neighborhoods offer food, people watching and entertainment–the trifecta of a fun night out. Brighton Beach and Coney Island are about a 10-15 minute walk from one another along a nice, wide boardwalk. 1. Eat: There’s pizza! There are hot dogs! There is mediocre Russian food (I’ll explain below)! Let’s start with the pizza. One of the best pizza parlors in the city, Totonno’s, is in Coney Island, not too far from the boardwalk. This is a classic New York pie. If you’re going to sully it with toppings I suggest crowd pleasing fresh garlic and pepperoni. Consistency varies, but on a good day, the pizza here is nearly unbeatable. Last seating is at 7:30 p.m., practically an early-bird dining hour in NYC. Then, of course, there’s Nathan’s Famous, home to one of the best hot dogs in the world and the yearly Hot Dog Eating Contest. I’m a sucker for the chili dog, but the original, topped with sauerkraut and onions is great, too. The dog itself is meaty with a satisfying snap. A bit of advice: go to the sprawling original location instead of the smaller oceanside outposts. Though the service there is painfully slow, the original has the freshest inventory. And then there’s the riskier Russian food option. If you decide to go this route, make sure to follow my rules exactly. 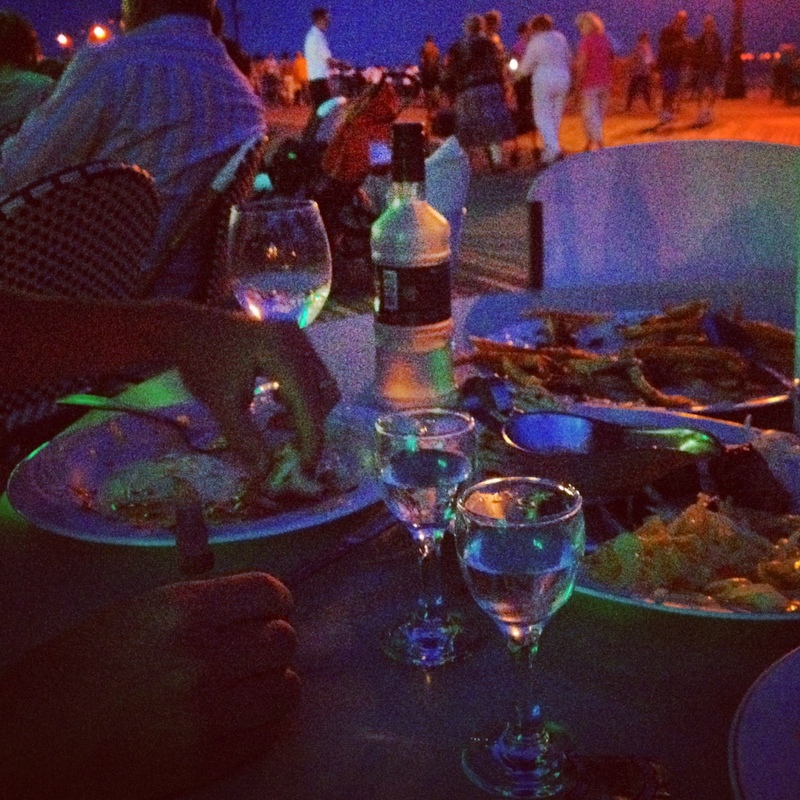 First, it’s better to go at night when the restaurants aren’t clogged with beach goers. Second, get a small bottle of chilled vodka at a liquor store on Brighton Beach Avenue, below the elevated subway track. Most Russian restaurants in Brighton are BYO, and we were actually once admonished by a waitress for paying for a few shots instead of bringing our own (it was late! the stores had all closed! ), and thus, according to her, wasting our money. Next, grab an outdoor table at one of the Russian boardwalk cafes. If you’re primarily after great food, go to inland cafes Oceanview or Skovorodka. Since it’s summer, ambiance is probably more of a priority. There are only three boardwalk options (Volna, Tatiana and Tatiana Cafe) and the quality is fairly comparable between them, so no need to fret about this decision. Now we’ve come to the most important guideline. Do not, I repeat DO NOT, order from the “American” section of the menu. Just don’t do it. “But I’m really craving a burger,” you say, “and “it’s hard to mess up, so I just thought I’d…” NO. Please, for the sake of all that is holy, do not do this. I can’t even guarantee it will be edible. Get traditional Russian (or Russia-appropriated) things like blini with caviar, fried potatoes with mushrooms, shashliks, etc. Those dishes will be good, if not life changing. Next, sit back and enjoy some of the best people watching in New York City. Russian families celebrating, elderly men and women walking arm-in-arm, surly Russians being surly. It’s a fascinating slice of Brooklyn that feels almost entirely removed from the rest of the city. It’s like a wormhole to seaside Odessa circa 1975. Another point: expect your service to be slow and probably somewhat rude. It’s okay, you’re using them for their location. You’ve got a 375ml bottle of chilled vodka, the sweet company of the person you’ve brought with you and the salty breeze blowing off of the Atlantic. You’re good. 2. Play: Aside from the preternaturally entertaining boardwalk and beach, you can indulge in a bit of minor league baseball or in a few amusement park rides. 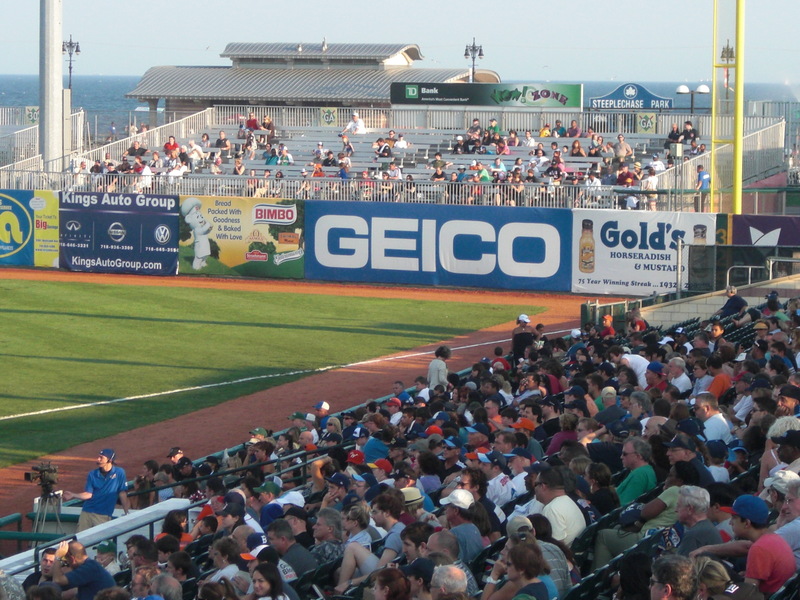 The Brooklyn Cyclones play in MCU Park, which abuts the boardwalk and overlooks the old parachute tower. Personally, I love everything about baseball except the actual game. I love the spectatorship of it, the beer drinking, the Dipping Dots eating. Did the Cyclones strike out again? Ho-hum. The Brooklyn Cyclones are also an organization that knows how to have fun with theme nights. This past July they hosted a Seinfeld-themed night, marking the show’s 25th anniversary. There were creative costumes, inventive signs and even a marble rye fishing competition. After every Friday and Saturday evening game the stadium puts on a fireworks display that rivals the pageantry of any small town July 4th show. Sounds fun, right? Well, unfortunately, the Cyclones’ season is over so save this idea for next summer! Luna Park, Coney Island’s amusement park, is still open on weekends through October. 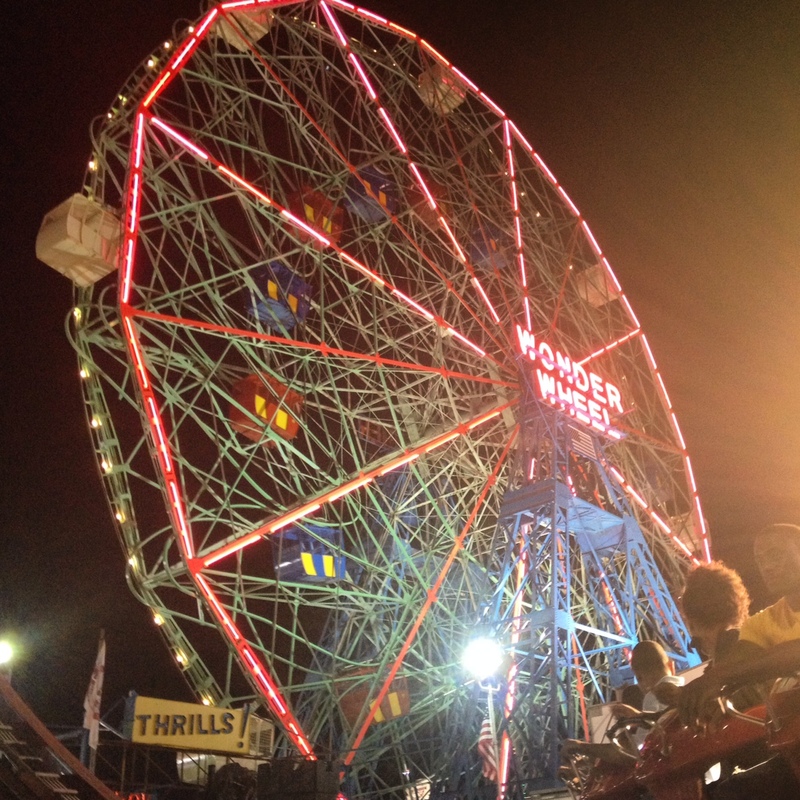 Come and ride the famed 87- year old Cyclone (not recommended for those with frail bones or the easily bruised) or the makeout mecca Wonder Wheel, a Ferris wheel with fully enclosed passenger cars for privacy. More than just a collection of historic rides, Luna Park also features brand-new coasters and rides that spin a full 360 degrees. Me? I’m more of a ride observer. My own coaster riding days are behind me, but it’s fun to watch the youngins’ have a grand time. I prefer the arcade sports–basketball and skeeball. Just leave me a bunch of tickets and check on me every few hours. Oh, and don’t forget to buy me a funnel cake.